The most technologically advanced heat press in the world! The new Air Fusion™ transforms the technologically advanced features of the Hotronix® Fusion into a pneumatic heat press for high volume and specialty decorators. Designed to increase throughput for faster production, the Air Fusion™ is equipped with a patented auto adjust pressure feature, which makes switching between garments of different thicknesses a breeze. A fully threadable platen allows the user to print on both the front and back of a shirt simply by rotating the garment without removing it from the platen. The adjustable stand is ideal for changing the height for multiple users and the hands free auto swing cuts down on operator fatigue. The new Air Fusion™ is reliable and durable. 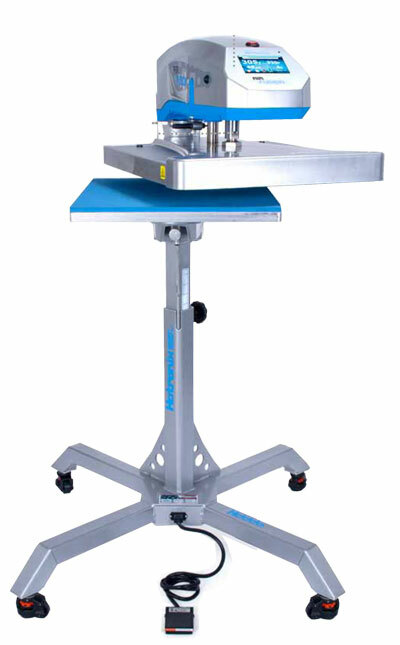 It's designed to maximize production efficiency and make garment decorating easier than ever. WORK SMARTER, NOT HARDER - The one-of-kind Hotronix® Fusion® just got smarter with the Fusion IQ™. This flexible feature gives you 100% access to every inch of the 16” x 20” lower platen, allowing for easy, precise placement and positioning right on the press. The Fusion IQ™ gives you access to stored application instructions, a larger and more responsive interface, one-click software updates and self-diagnostic capabilities. Plus, you’ll have the peace of mind knowing you can manage your press from any place, anywhere with the Fusion IQ™ Portal. Tap the foot pedal and the upper platen will swing into place! 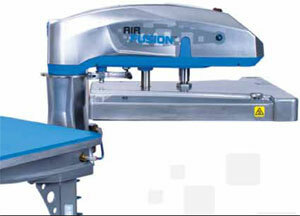 The Air Fusion™ is perfect for pre-treating and curing garments for direct-to-garment printing. The pneumatic heat press compresses to 120 PSI and flattens the fibers on the garment and provides a smooth, even surface for the inks to adhere. Prints actually look brighter and crisper, giving you the best possible results. The pre-treatment process creates additional moisture, which can cause a press to rust or even interfere with its sensors. Not with the Air Fusion™! The aluminum corrosion free framework on the Air Fusion™ actually combats the moisture. The press will look like it just rolled off the assembly line for years to come.